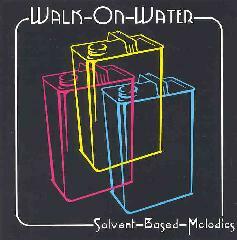 Walk On Water - "Solvent Based Melodies"
A quartet from Detroit, Michigan, Walk On Water plays up-tempo, heavy psychedelic rock in the manner of Dead Flowers or like a somewhat kinder, gentler Monster Magnet. However, that description doesn't tell you what you really need to know, and that is that SBM is absolutely brilliant from beginning to end. OK, so it's merely a mini-CD collection of six tracks totalling 27 minutes, but you could tack on 20 minutes of shrill feedback on to the end of this release, and I would still give it strong consideration as full-length album of the year! 'This Planetary Exploration Plans' opens up the album with crunching low-end guitar/bass and unbridled energy. Vocalist/guitarist Mark Kahaian has a strong voice with a clear tone, a nice respite from the gruff sound you'd normally expect. 'Moving Faster Than Light' covers similar territory, but here we discover that Billy Reedy can put forth some lilting guitar licks and phase-shifted leads in addition to the heavy riffing. Kahaian belts out, "Faster than light, experience audio sight." Well, I like what I see! What first starts out as a change of pace, the beautiful and totally cosmic 'It Will Burn Out,' then segues into the instant classic track 'The Vortex Inside.' WOW! This one really smokes, and brings to mind other such psych masterpieces as Kingston Wall's 'The Real Thing' or Dead Flowers' 'Altered State Circus' (or 'Hammer Rash' for that matter). To wrap up the album, 'Highway 80 to...' leads directly into 'Armenia, City in the Sky' (accent on the third syllable of Ar-men-I-a), both tracks sounding retro by recalling 60's psychedelia stylings. (Made me wonder if these guys were direct descendants of the MC5.) Still, all nostalgia leanings aside, both tracks keep me interested and are downright fun. Armenia actually contains a bit of a bonus section of ambient music that's tacked onto the end, and is a nice way to finish up a masterpiece that through its brevity provokes the patented Teletubby response, "Again! Again!" SBM is the third release from Walk on Water, following another mini-CD (1993) entitled "Carotid" and their 1996 full-length release "High Fi," currently on the top of my 'to get' list. This band needs to be at next summer's Strange Daze Festival (for my sake as much as theirs), and I'm going to do my best to make sure it happens. Even if they simply reproduce what they've recorded here, it would be a delectable treat to hear. But I'm guessing they're even more energetic and psychedelic live. You can visit Walk On Water at their web site.